As part of our journey travelling from Voss to Bergen (via Hardangerfjord) we planned to take one ferry from Ulvik into the lovely town of Eidfjord, then a second, later ferry, back through the Fjords (past Ulvik to Norheimsund) from where we would continue to Bergen. 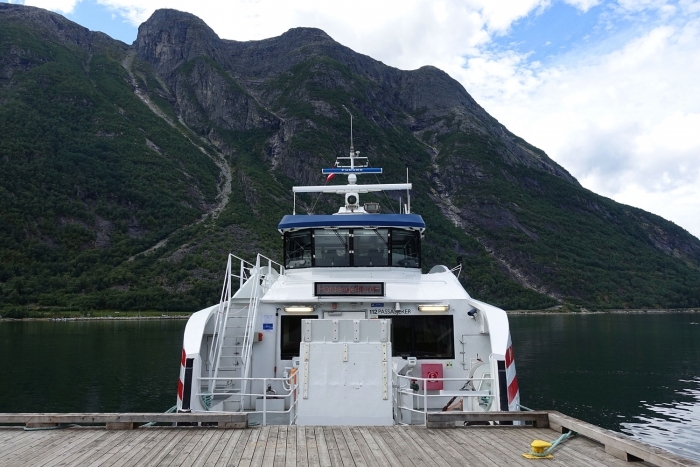 We arrived at Eidfjord, dazzled by the beautiful first half of the ferry journey, and dropped into the tourist information to see if we could grab a map. While we were looking around in there, a flyer for Flat Earth Adventures' kayak tour caught our eye. 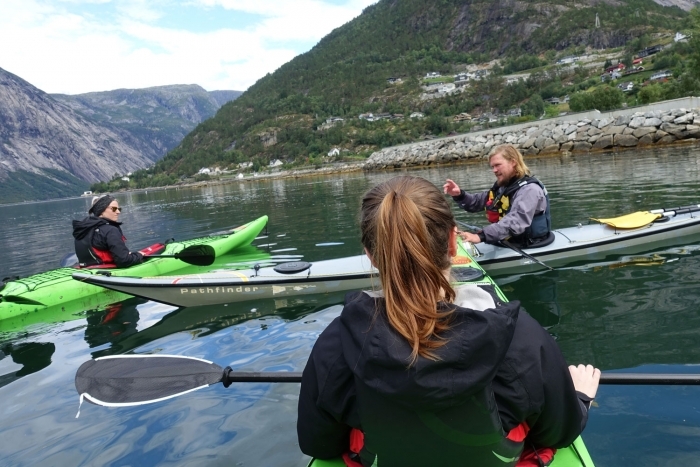 The tour would take 3 hours and cause us to miss our onward ferry, but while the ferry could provide us with more views further along the fjord, actually kayaking on the fjord itself would add a completely new dimension to the trip, and a new experience for us both as well - we haven't kayaked on our travels yet! Sorry Mr Ferry - looks like we aren't going to be using you again today. We met our guide-to-be on the pebble beach, west of the ferry wharf where we were introduced to a young German couple who would make up the rest of our group. Later we heard that when larger cruise boats are in port the groups can be considerably bigger so we were glad of our small team of 5. 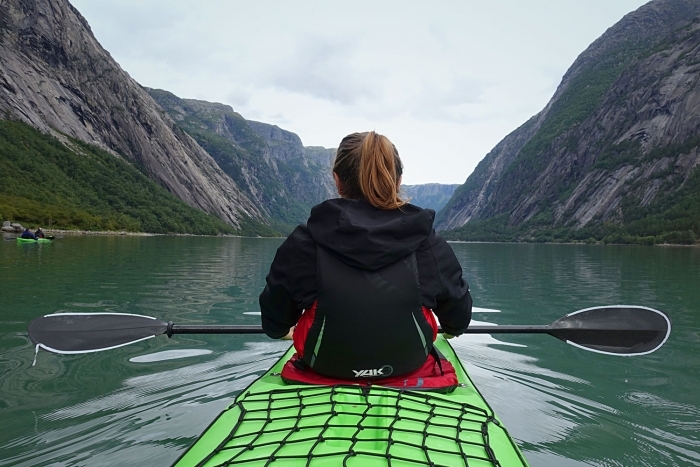 We were given the option of either using individual kayaks or two-person kayaks, opting for a double kayak so that one could rest or grab some photos while the other paddled. After being shown the basics (how to hold the paddle, how to get into the kayak etc) and offered a nearby bush under which we could hide our bags ("It's fine; No one has reported anything stolen so far." - I love small towns! 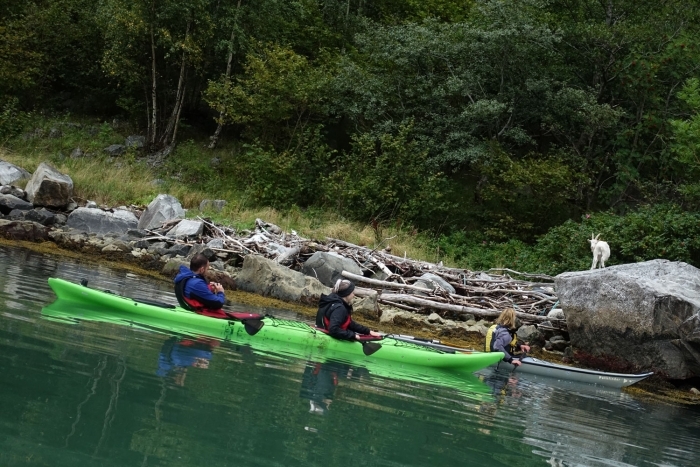 ), all that was left was for us to jump in the kayaks and head forth. 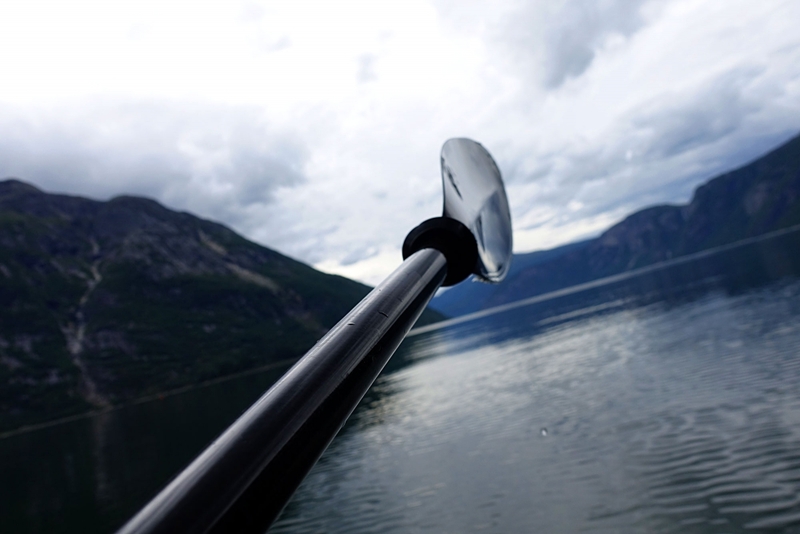 Our group opted to turn right out of Eidfjord, then made our way eastward, down the adjacent Simadalsfjorden. This fjord didn't have any boat traffic and, while we typically stayed closer to the coasts, it was very fun to sit dead centre, looking down the length of the fjord. The trip was about 7km long which sounds like a long way to paddle, but it isn't too bad. The guide was receptive to how everyone in the group was doing and we'd take regular breaks to allow people to rest. We had a water-sealed compartment on the boat in which we were able to stow most of our more valuable belongings. While capsize on the larger kayaks is less likely, especially in the conditions we found ourselves, I was warned against keeping the camera on me, but I wasn't going to miss the photo ops and so managed to keep it wedged in a pocket under the life jacket while we paddled (yay for compacts!). The full trip took us about 3 hours to complete, sometimes just paddling silently taking in the view, and other times chatting with the rest of the group, with the occasional fact or insight from our guide if we had a question to ask or saw something interesting. By the time we got back to land we were aching, but happy; Our last minute kayaking trip had jumped up the list to become one of our most favourite aspects of our recent travels, and something I will remember for a long time to come. 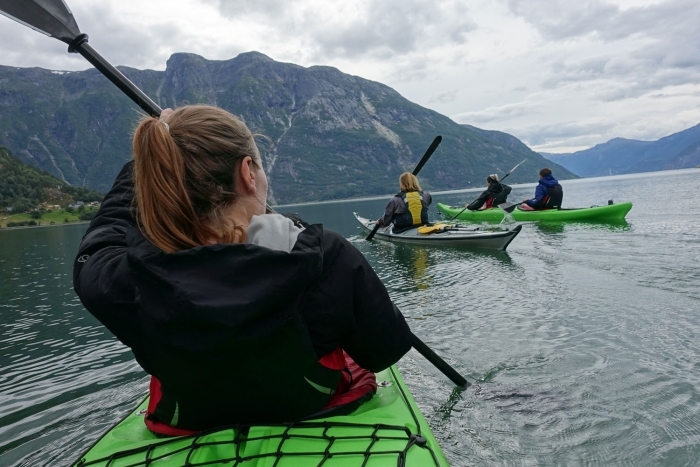 Very often, especially during tightly scheduled trips like this short time in Norway, it can be daunting to do something spontaneous and change plans last minute, but when unexpected opportunities come along, sometimes it is worth shaking plans up for them. Want to hear how the rest of the trip went? 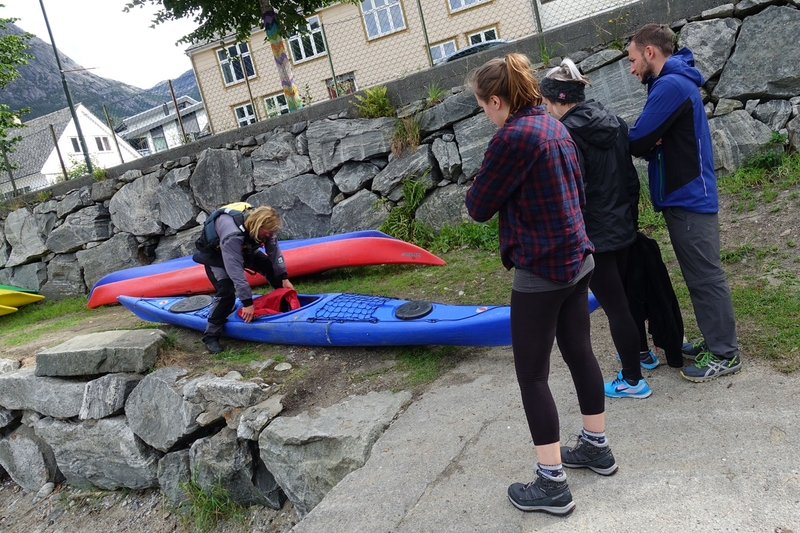 Read how the journey from Voss to Bergen continued.